PISSOF troops say they are to impose martial law and a curfew on all areas under their control in Nannan Province as violence in the area continues to escalate. Ztum-Setum Online News was sent the following message yesterday, signed by Yohan Mier "Nominal Head of Petramco Industries Overseas Forces". "Following recent criminal activities in Petramco held territories (led & funded by illegal insurgents) Petramco Industries wishes it to be known that our zero tolerance policy of these & similar activities will result in martial law & curfew being imposed on out territories as of 7pm (German time) tonight. "Any personnel found abroad after such time will be considered to be a terrorist and summarily executed. But, according our correspondent in Nannan City, PISSOF troops are struggling just to defend the small areas still under their control in a city which is in open revolt. "I have not seen any PISSOF troops on the streets of Nannan City for several days now" he said in a report filed today. "Spurred on by fundamentalist preachers, armed mobs of religious zealots are roaming the streets, burning the houses of Petramco employees and attacking known followers of Heviosso, leader of the ZITS and self styled "Prophet of Agassou". "PISSOF forces are barely managing to protect Petramco facilities, which are under frequent attack by armed mobs, and their barracks are full of workers unable to return to their own homes." Retreating troops attack refugee column (08.05.82). WARTZ and FARTs troops retreating after their defeat by ZWEATE last week (see below) attacked a column of refugees on the border between Setumsia and the Federated African Rhodesian Territories today (8 May. 1982).. The refugees were being escorted by a column of troops from the ZSA Alliance commanded by Brigadier Zose Stumbo, who personally led a small rearguard force which in delayied his enemies for several hours whilst the bulk of the ZSA troops escorted the defenceless refugees to safety. 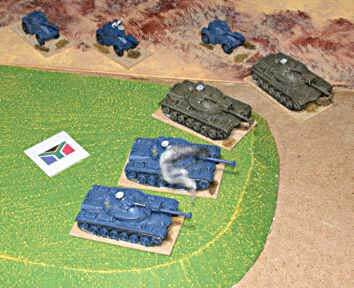 Stumbo's armour destroyed an elite unit of WARTZ tanks before being forced to retreat by massive numbers of WARTZ and FARTs troops, whilst Setumsian militia halted the advance of enemy infantry before retreating at nightfall after suffering minimal casualties. The Brigadier was killed leading an armoured counterattack and has been awarded the Setumsian Cross, his country's highest award for bravery. The refugees are now safely housed in a transit camp and the Setumsian government has called on the United Nations to investigate the incident and to take appropriate action to protect the safety of the thousands of people who are fleeing the oppresssive regime in the Federated African Rhodesian Territories every week.